Salespeople give presentations throughout their career and will be experts at giving presentations to sell products. 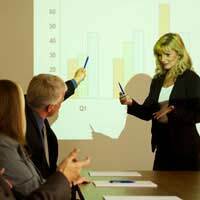 When it comes to presenting to the board of their own company though, the techniques will be subtly different. When selling to a customer a salesperson is selling the product or service, although in reality most people in business are aware that it's the personal relationship that the salesperson creates that results in the sale. But presenting sales figures for the past year or quarter to your own board is different, the selling process will not be about building a relationship in the same way. Apart from anything else, a salesperson presenting to a board will almost certainly be well known to most of the board members. The key to a good introduction is to keep it short. If the presentation is part of a regular board meeting then no one will thank you for making it drag on. If perhaps you don’t know a few board members then give them just your name and area of responsibility. Example: Good morning everyone, thanks for the opportunity to present the quarterly sales figures today. For those of you I haven’t met before my name is Sally Farnsworth, Area Manager for the south, and I'm deputising for the General Sales Manager because he is heading the stand at the conference in Denver this week. If this is a regular fixture then there'll probably be a template that you can follow in terms of a presentation. Again keep it brief and stick to the headline figures but be ready for questions. Make sure you have the underlying facts and figures at your fingertips in case anyone wants to drill down into them. Example: We're seeing a softening of demand in the Far East because of the exchange rate and we're focusing marketing spend in areas where we are more competitive until that situation changes. Brief is best but show that you are on your toes by summarising any key points or actions that have come up. Even if you've had to take some flak make sure you remain bright and positive but don’t go too far or you'll appear flippant. Example: Thank you everyone, I'll let you get on with your meeting. I'll talk to the IT team to work out how we can get the figures presented in the way you've requested for the next sales presentation and I will issue a more detailed Far East breakdown by email before the close of business tomorrow. This is all very well, and you do need to be brief, as you'll only be one part of the board meeting. But you do need to be persuasive, to illustrate why your product or service is superior to competitors, what it can do for them and how it can save money. Be factual and don't exaggerate, but make sure you weigh things in your favour, and remember, you only have one shot at the board, so make it count. Have handouts to back up what you say and leave them with everyone so they can consider what you've said later.